Antiwar March outside Crisler Arena on the University of Michigan Campus, September 20, 1969. Courtesy of The Detroit News Collection, Walter P. Reuther Library, Archives of Labor and Urban Affairs, Wayne State University. From 1965 until 1972, the campus of the University of Michigan became a stronghold of political activism and intellectual discussion against the war in Vietnam. Students, faculty, and the administration of the University all played roles in advocating and resisting political change. The University of Michigan witnessed the full range of political protesting from an academic forum to explosions at the ROTC building during this tumultuous time in United States History. 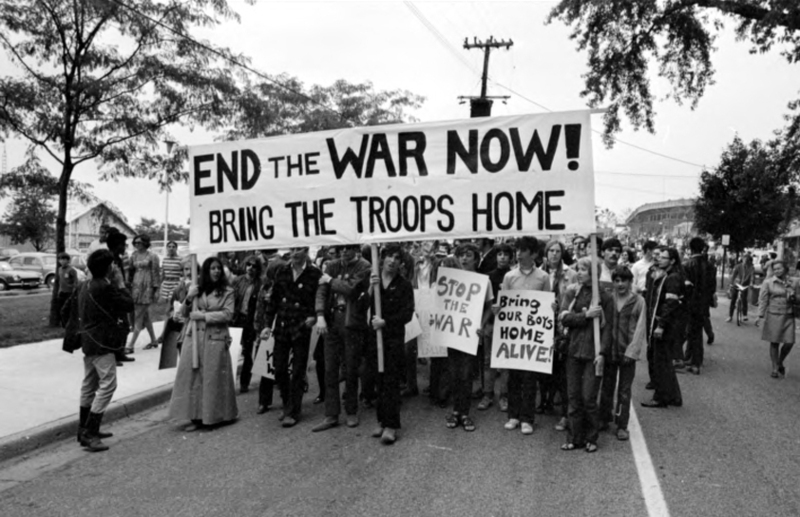 The "Anti-Vietnam War Movement" exhibit from the Michigan in the World series publicizes research conducted by undergraduate students about the history of the anti-war movement at the University of Michigan.